There’s been something going around the country recently, and it’s a disturbing trend. I brought up my news feed to get a little bit caught up after an emotional and draining day, and what do I see? Another school district cancelling classes for a day because of a threat against one or more district facilities. Obviously in the wake of San Bernardino people take this stuff seriously, never mind the recent third anniversary of the Sandy Hook shooting. It was that incident which led to the most recent restrictions on gun ownership here in Maryland. Of course, I know of a handful of people who are convinced Sandy Hook never happened except as a “false flag” incident designed to be the pretext for confiscating our weapons, but I’m not into that sort of conspiracy theory. If the government has it in mind to do something, it’s eventually going to happen whether they get the excuse or not. To me, this may not be a bad time to review policies and procedures for our local school district. It so happens that Friday was their last day before going on an extended winter break which runs until January 4, so there’s a chance over the holidays to look at the prospects for mischief and plan a course of action. While we’re not a large community, we are certainly no more immune from trouble than any other school district serving a county of 100,000 people. Nor do I think a limited concealed carry regimen within the school, through teachers who already have or wish to obtain the proper permits, is a bad idea. It’s certainly better than declaring schools a gun-free zone and watching kids be helplessly slaughtered by the first person who ignores that designation. Fortunately, the schools which have closed have done so without incident. And while no amount of preparation can assure our schools will be completely incident-free, perhaps now is the time to deal with the likelihood something could happen. I wish I’d thought of this before I sat down since I was in the same room as two of our school board members this evening, but I think they’re smart enough to read here. If we put them on the board they must have some intelligence, right? It may be a little over the top, but if radio host and writer Erick Erickson wanted some attention he got it. 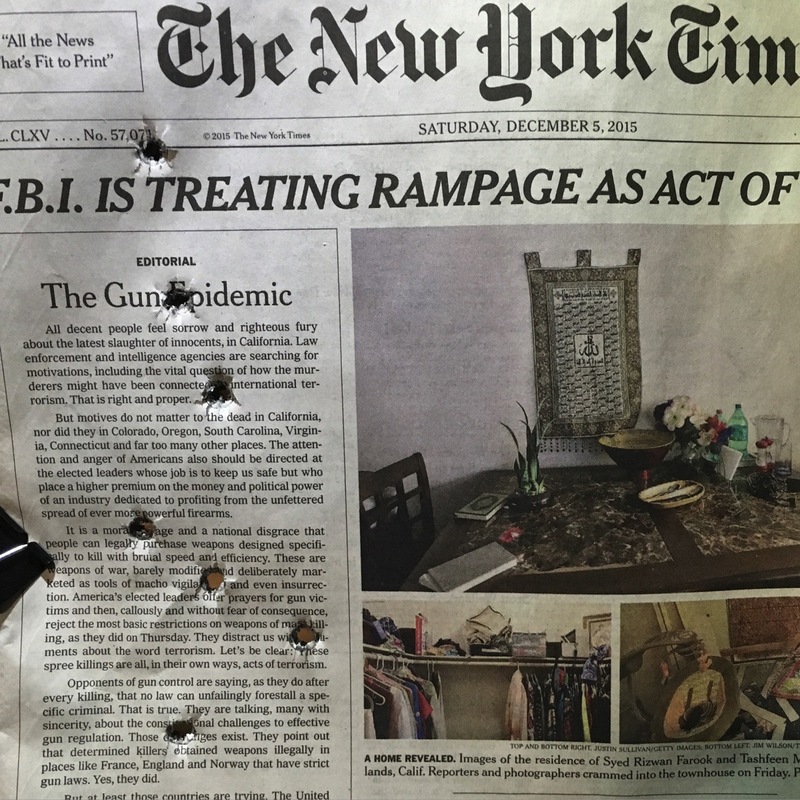 The United States suffered its worst terrorist attacks since September 11 and the New York Times’ response is that all law-abiding citizens need their guns taken away. Screw them. The New York Times wants you to be sitting ducks for a bunch of arms jihadists who the New York Times thinks no doubt got that way because of the United States. I will not claim an armed resistance among the group would have eliminated casualties, just like having armed resistance in Paris may or may not have saved dozens of lives. In the chaos of such a situation, innocent people would likely have died in a crossfire. But these “lone wolf” terrorists only seem to hit soft targets where they can reasonably figure everyone is unarmed – you wouldn’t see them raid a police station because their odds of survival long enough to kill multiple police officers in exchange for their lives would be relatively slim. As the San Bernardino pair found out in their final seconds, they can’t outgun a gauntlet of officers who fired almost 400 shots into their rented vehicle. So the only thing I have to say about Erickson’s little stunt is that his grouping could have been somewhat better. Otherwise, he is right on target.